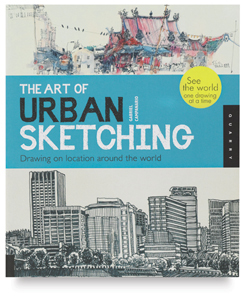 This is your website for books, information, tools, and resources to do urban sketching. You will find new ideas and tips to create urban sketches. Find out about pens, paints, markers and sketch pads. Learn how to find and join groups of fellow urban sketchers for sketchcrawls and urban sketching outings. Urban sketching on location is making a comeback among the artists community. While many artists enjoy drawing and painting landscapes, gardens, or nature scenes, urban sketchers get out there in the nitty gritty of cities, towns, and villages in many locations around the world. It's a new social movement in art! Urban sketchers on location need tools that are compact, packable, and easy to use. Aside from that, urban sketching is done with a wide variety of materials. Believe it or not, this is just a partial list. Watercolor paints: travel kits with dry paint, brushes, water source, rags. What else might you use? Add to the list. Read More about tools for urban sketching. From the survey below, it seems that many artists would like to learn more about composition. How do you pull together the elements you see on location to make a good drawing? I'm looking forward to addressing this topic here at Urban Sketching.com. To start, here is a handout that I give to students at my landscape painting classes. Composition Basics All artists use basically the same composition rules to make great artwork. Learn about some of these composition basics and watch your artwork improve dramatically. Free! Download this sweet article on composition. Free! Why not go to the UrbanSketchers.org website to find out more about this exciting organization and wonderful group of people! Note that UrbanSketching.com is a separate and independent website for resources, tutorials, and links about urban sketching. Hello, my name is Karla Beatty. I AM an artist and writer who loves to travel and visit cities around the world. Urban sketching is my latest craze and I enjoy helping other people take part. I hope to see you at a SketchCrawl or other urban sketching event!